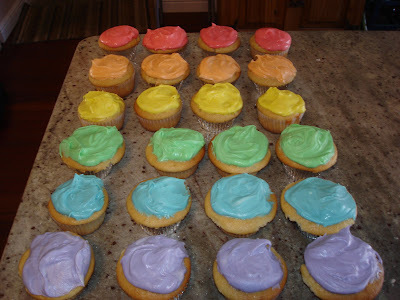 A Kitchen In Brooklyn: Sasha's Kitchen: A Rainbow Of Honey Vanilla Cupcakes! Sasha's Kitchen: A Rainbow Of Honey Vanilla Cupcakes! Vanilla cupcakes are the simplest of cupcake recipes, in that it's similar to forget about them and get caught up making all the fun and unusual flavors of cupcakes. However, it's actually harder to get vanilla cupcakes just right than any other type of cupcake. They're less forgiving than chocolate, for sure. Today's vanilla cupcake recipe is a modification using honey as the primary sweetener, based on Bill Yosses' (The White House pastry chef's) cupcake recipe for honey-vanilla cupcakes found on the Obama Foodorama Website. My recipe is a bit different for a couple of reasons: first I doubled the recipe for 24 cupcakes, instead of 12, but also made some ingredient adjustments to get the cupcakes just the way I like them. However, I was certainly inspired to use organic honey in preparing them, just as the chefs at the White House have been, using their own on-site beehive. Let's clarify though - I simply bought a large container of organic honey - no beekeeping for me! I did not use Yosses' frosting recipe at all, but used the very same frosting recipe that I developed for my Chocolate Stout Cupcakes. 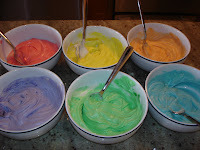 Then I divided the frosting into six bowls and prepared six different icing colors, and used the cupcakes to make a rainbow of colors. Preheat the oven to 350 F. To make the cupcakes, mix the flour, baking powder and salt in a bowl. Then beat the butter and sugar in the mixer. Add the honey. Here's a trick for adding the honey so you don't have it all sticking to the inside of the measuring cup. Coat the measuring cup with a T of Canola oil and then pour out the oil. When you add the honey to the cup, it will slide right off and into the basin of your mixer, without leaving any residual honey in the cup. Add the eggs, buttermilk and vanilla to the mixer, beating at low-medium speed. Then add the dry ingrediants and mix well. You can add a tad of additional buttermilk if its a bit too thick (that's how I wound up using 1 1/4 cup rather than 1 cup of buttermilk). Fill two cupcake trays with 24 liners. Fill 3/4 of the way to the top. Bake the cupcakes for about 25-30 minutes at 350 F, until very lightly browned and cooked through. You can test with a fork or a toothpick to make sure the inside is done. My husband usually does the test, and he just seems to know when they are ready to come out. Allow the cupcakes to cool fully before you frost them. To make the froasting, follow the instructions for my Chocolate Stout cupcakes, since its the same frosting. Beat the butter, confectioner's sugar and cream cheese well. Then add the heavy cream and the vanilla. I then divided the frosting into 6 bowls. To color the frosting, use gel frostings, and not the conventional frostings at the grocery store, which would make the cream curdle. I used the same gel frostings that I used in making Royal Icing for my purse and shoe cookies, from NY Cake. You could do pretty much any color that makes you happy. Cupcakes make terrific birthday party cakes, in a less traditional sense. So, for a child's birthday party, you could make a lot more cupcakes, frost in many colors, and then arrange the cupcakes to spell out your kid's name, a picture, animal or whatever would make your little one smile. The creative options here are endless! 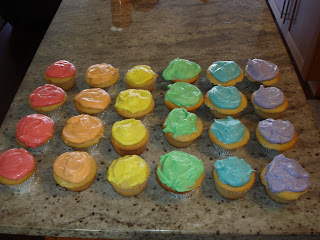 In this case, my goal was simply to create a rainbow of cupcakes, so I selected the colors that are in a rainbow.